Continuing the first part, in this part I will discuss about accessing internet on Trisquel 8.0. 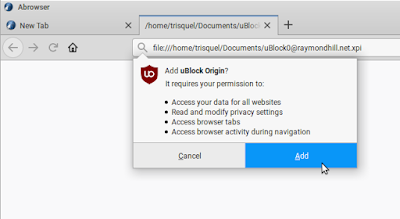 This includes how to operate built-in programs for web browsing (Abrowser), emails (Icedove), chatting (Pidgin), and downloading torrents (Transmission). Nowadays everyone needs these a lot on their PCs and laptops including people with no technical skills so this kind of guide is important for them. 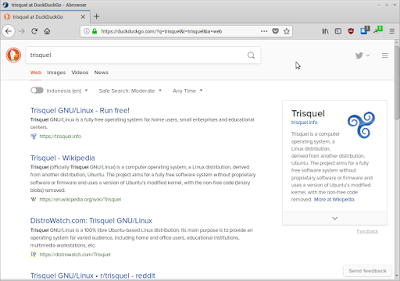 I hope this guide will be really useful for you starting with Trisquel GNU/Linux. Happy working! Trisquel OS is best on PC and it's best to use cable internet access. 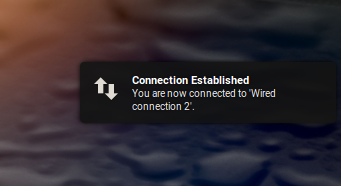 If you have one, just plug the cable into the LAN port and you should see Connection Established notification like this on your screen. How about wifi? Please see Special section in the end. However, seeing how complex this issue can be, and how difficult a normal user to solve problems themselves, a temporary solution is using USB Tethering from a smartphone if you don't have other internet source at all. Where To Surf the Internet? On the bottom panel, near start menu, you see a globe icon. 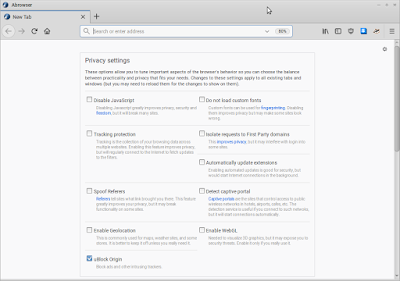 That is your browser on Trisquel, called Abrowser, a modification of Firefox with security and privacy enhancements. You can also find it on the start menu > Internet > Abrowser Web Browser. 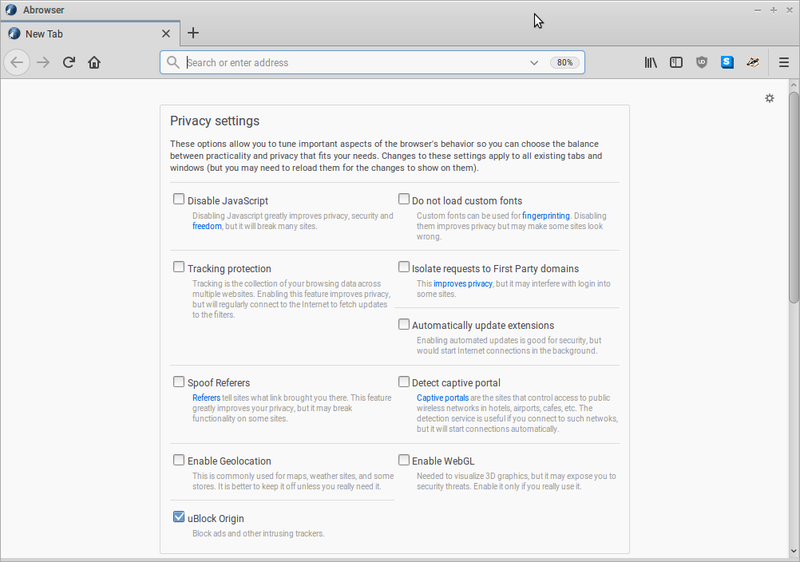 When you first launch Abrowser, it looks very similar to Mozilla Firefox. You can start typing any website address you wish to see. For example www.trisquel.info. To show menubar, press Alt once, and click the menu. However, this is not permanent. To show it permanently, right-click on the tab area > give check mark to Menu Bar > OK.
DuckDuckGo is the default search engine in Abrowser, not Google. Just type everything on address bar* and press Enter. 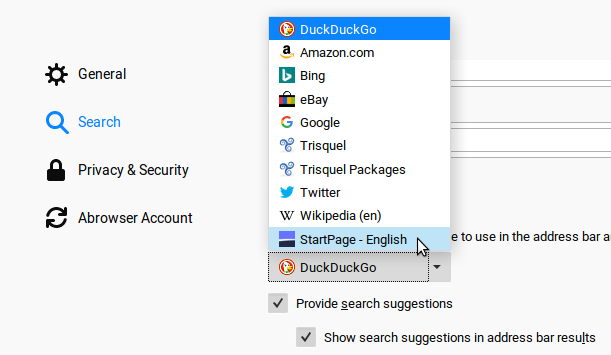 To change the search engine, go to menubar Edit > Preferences > Search > change DuckDuckGo option into another one. 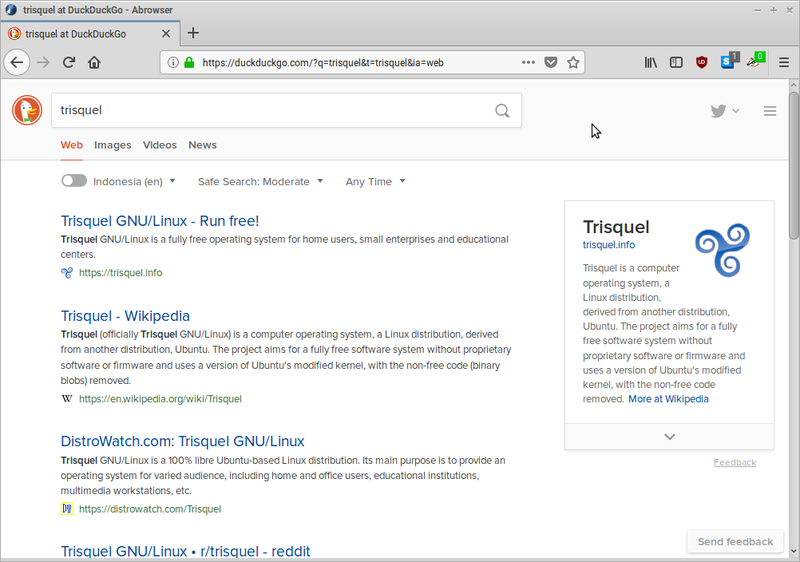 However, by default Trisquel 8.0 provides Google and Bing other than that, and, you can manually add StartPage if you go to their site. *) Shortcut key to put cursor into address bar is F6. 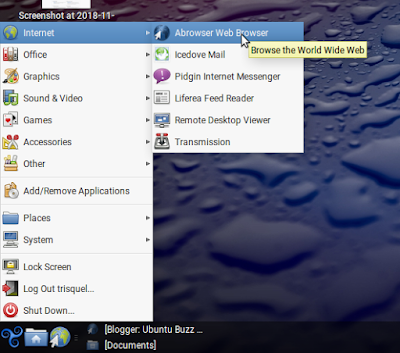 Abrowser can use Firefox's addons. If you have collections of them in XPI format (just like me, I love to have them offline), you can drag-and-drop one to Abrowser tab area and accept installation. Like below. And, this goes without saying that you can install addons from Mozilla Firefox Addons Website as well. However, it's recommended for you to install addons* from Trisquel Abrowser Addons website instead. *) Shortcut key to open addons installation website is Ctrl+Shift+A. 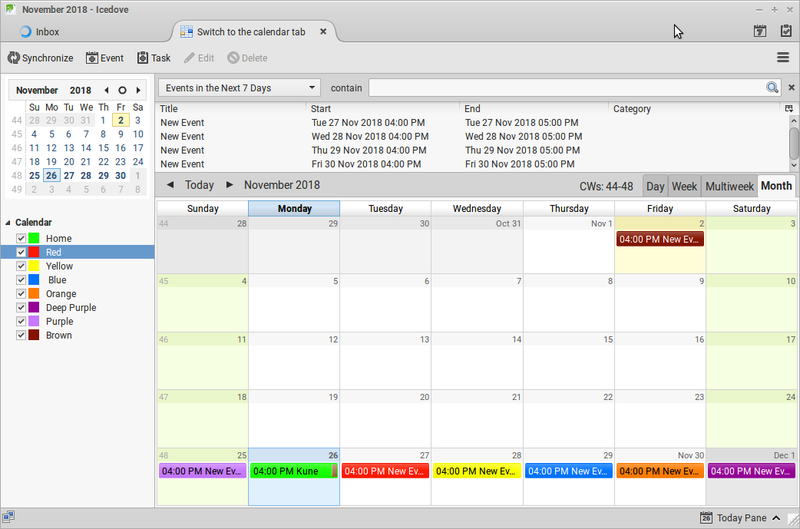 On Trisquel 8.0, Icedove is both email client and desktop calendar. 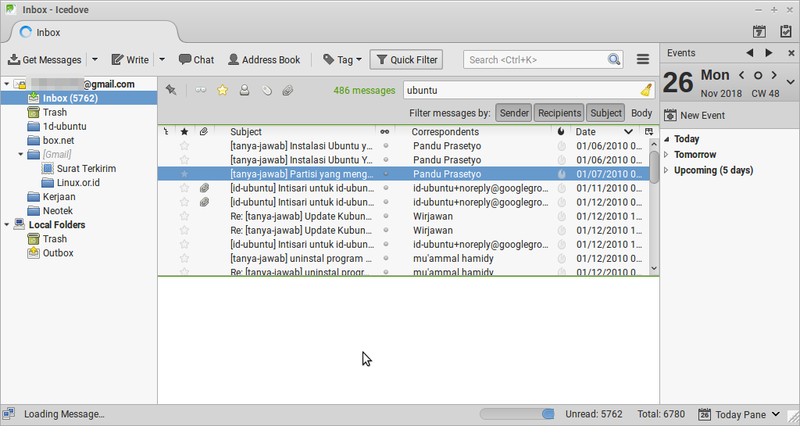 Basically, Icedove is email client software to put on desktop your emails, no matter you have Gmail or Yahoo! or company mail accounts. Think about Icedove as replacement to Outlook on Windows and Apple Mail on macOS. However, actually Icedove is a modified version of Mozilla Thunderbird, with same features (literally, Ice is not Thunder, Dove is not Bird). With its calendaring feature, you can schedule your works for a week, a month, and beyond. 6) OK, now Icedove downloads your Gmail inbox. Once downloaded, all emails can be read offline. Trisquel 8.0 includes Icedove with calendaring feature built-in. To create a schedule, simply double-click a date. You can group your schedules with colors, as you can make several calendars with different colors and choose certain calendar every time you make a new schedule. See picture above, left panel and main area. With Liferea, you can subscribe to every website and news on the net you love to read in one place. By default, Liferea on Trisquel subscribed to Trisquel and FSF sources. 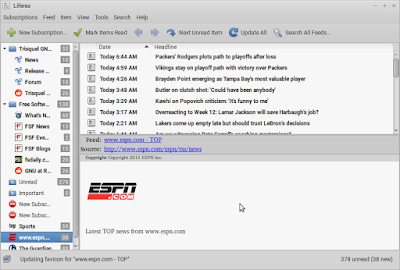 Open Liferea on start menu > Internet > Liferea Feed Reader. To add new subscription, for example ESPN Sport News Website, its RSS feed addresses list is here, then add one address to New Subscription and go. You are subscribed to ESPN now. 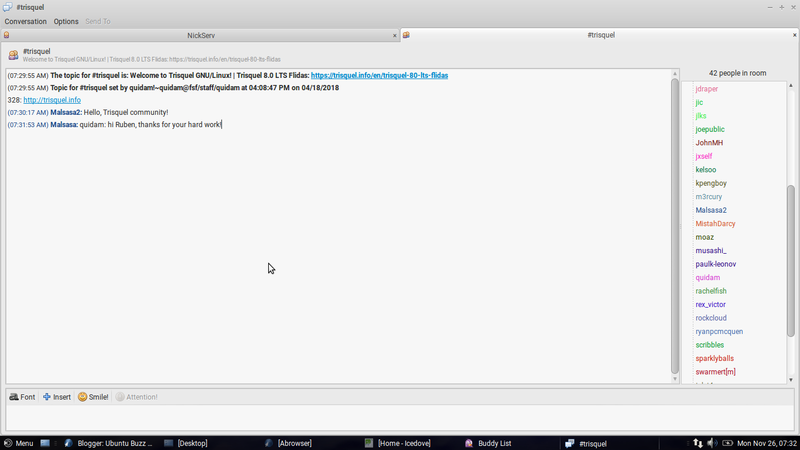 With Pidgin, you can chat with your friends and communities on IRC, XMPP, Yahoo! Messenger, and many more. It's really exciting, not like proprietary operating systems, you can contact Trisquel developers directly by joining their IRC chatroom. All people are welcomed! 5) once joined, you will see Trisquel Community welcome message on the top with list of chat friends on the right panel. Transmission is a BitTorrent client program, a program which uses the biggest Peer-To-Peer network on this world, a popular kind of program to download extremely huge files over the net such as ISO images and movies in really high speed. 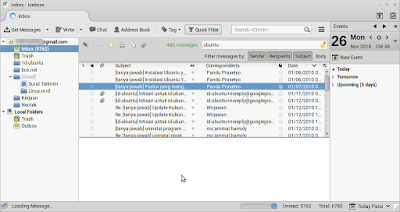 To use Transmission, you can download hundreds of choices of GNU/Linux distros via torrent, by opening the .torrent file. If you want to test download them, see Debian ISO torrents or search yourself at LinuxTracker.org. Most WLAN adapters (inside laptops) don't respect free software users: they force the users to use nonfree firmware and/or nonfree driver. Nonfree means not "commercial", but you don't receive proper rights over the software to change and make it works as you wish. Vendors who don't free those software for you (the hardware buyers) don't fulfill your rights to use it. 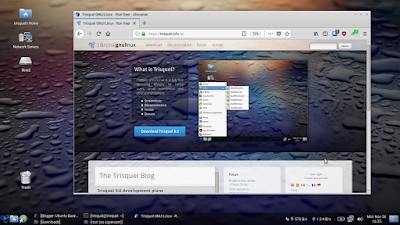 You may find yours cannot work on Trisquel, as Trisquel includes only free firmware & drivers. Yes, this is a complicated issue but there is a permanent solution. The solution is, you may want to purchase a WLAN adapter which works with all GNU/Linux distros without nonfree software such as one from Technoethical or from ThinkPenguin. See also hardware recommendations on FSF's Hardware-Node website. That's all. Next part I will talk about how to understand and manage your file system including your home folders and disk partitions. Enjoy Trisquel!